Colon prep options have certainly gotten better since I had my first colonoscopy several years ago! I recently had my second colonoscopy — but I was dreading it because of how terrible the bowel prep was last time. To prepare for my first colonoscopy, I had to chug a gallon of polyethylene glycol electrolyte (PEG) solution. That stuff tastes nasty, even with its fruity flavoring — and I find it difficult to consume in large amounts. So you’d never guess how happy I was when I made my appointment for my second colonoscopy to find out about CLENPIQ. Before I go any further with my CLENPIQ review, I want to let you know that I have no personal, professional, or financial connections to CLENPIQ, its Swiss manufacturer ASM Aerosol-Service AG, or its distributor Ferring Pharmaceuticals Inc.
I’m just a regular guy with a family history of colon cancer. And, I’m over the moon with this simple colonoscopy prep drink. What Is CLENPIQ Colonoscopy Prep? 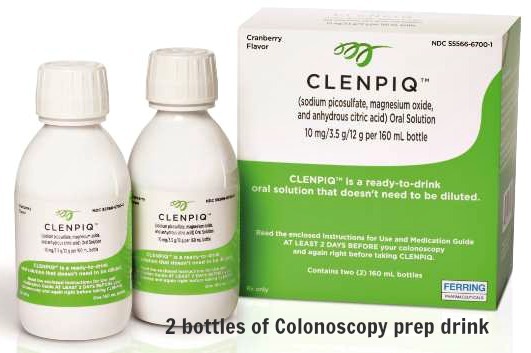 CLENPIQ is a colonoscopy prep drink that was approved by the Food & Drug Administration (FDA) in November 2017. CLENPIQ came onto the market during the first months of 2018 — right before my second colon screening. The timing worked out well for me. This new colon prep is so much easier and more pleasant to take than the other bowel prep drinks! 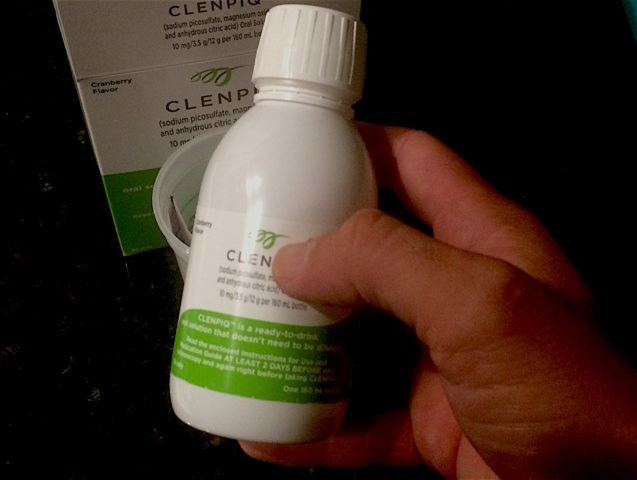 Unlike the 128 ounces of PEG solution that tastes like burning plastic and teases my gag reflexes, CLENPIQ is a simple colonoscopy prep drink that comes in two 160 mL (approximately 5.4-ounce) bottles. My CLENPIQ drinks came in a cranberry flavor — making the chalky texture of the drink very palatable. CLENPIQ comes in relatively small bottles. However, they don’t replace the many cups of clear liquids you must also drink before a colonoscopy. What CLENPIQ does is eliminate the need for drinking the large volume of more traditional bowel prep drinks that are hard for many people to consume without experiencing nausea, vomiting, or other problems. My gastroenterologist provided me instructions that followed the CLENPIQ dosing instructions included in the box of this colonoscopy prep drink. As a day-before colonoscopy bowel prep — You take one bottle of CLENPIQ in the afternoon on the day before your colonoscopy and another 6 hours later in the evening the night before your colonoscopy. As a split-dose regimen — One bottle is taken late in the afternoon on the day before your colonoscopy and another about 5 hours before your colonoscopy. Both methods require drinking several glasses of clear liquids. Also, I was told to stop taking certain medications in the week leading up to my colonoscopy (though I don’t ordinarily take any oral medications). I’m not diabetic, but I understand diabetics generally should avoid taking oral diabetic medications on the day prior to their colonoscopies. This is something you should discuss with your doctor before your colonoscopy, if you have diabetes. As for me, I had no special medical instructions. However, I couldn’t eat any solid foods after 9 PM on the day before my colon prep (which was 2 calendar days before my colonoscopy). The first bottle was followed by at least five 8-ounce cups of clear liquids within 5 hours of drinking the first CLENPIQ colonoscopy prep drink. The second bottle of CLENPIQ was shortly followed by three 8-ounce cups of clear liquids not fewer than 2 hours before the colonoscopy. While my experience in taking CLENPIQ was fairly typical, you may require different dosing than was prescribed to me. Ask your doctor what plan is best for you. Let me assure you… any CLENPIQ dosing requirements are surely better than drinking a gallon of nasty colon prep! I was also told to be on a clear liquids-only diet for the entire day before my colonoscopy. What Exactly Are Clear Liquids? Water — Mmmm… Um, watery!…? Tea and black coffee with NO milk, cream, or lightener — But my doc said sugar is OK! Flavored water without red or purple die — Because red or purple dye may look like blood or mask other unusual things in your colon. Clear, light-colored juices (white grape, apple, pulp-free lemonade, and white cranberry) — Hey, there’s something sweet and tasty to choose from. Popsicles without fruit or cream that are NOT red or purple — Something nice and cool for those hot colonoscopy prep days, you know! Oh, and I hate to be the bearer of bad news, but you can’t have any alcoholic beverages, smoothies, or milkshakes while having your colonoscopy prep drink. There are other types of drinks you shouldn’t have before your colonoscopy, too, but I wanted to break the worst news to you first. Now for some good news… I was able to drink each of the 2 bottles of CLENPIQ in only a few gulps! Yes — chugging the CLENPIQ colonoscopy prep drink was a virtually painless process. How Much Does CLENPIQ Cost? According to most pharmaceutical websites, CLENPIQ costs around $150 as of this writing. However… that’s only for those who pay for their colonoscopy prep drink with cash. If you’re going to use insurance, then your out-of-pocket cost will be lower. As for me, I have a major PPO comprehensive medical insurance plan. I paid $50 out of pocket to buy CLENPIQ from a local brand-name chain pharmacy store. If you wish to receive a discount to buy CLENPIQ, I suggest talking with your doctor for alternative payment options or call your insurance company. You might also consult with your local health department for information on how to buy CLENPIQ at cheap prices. Again, CLENPIQ made my colonoscopy prep experience a breeze — so even if you have to pay a little more to buy CLENPIQ, I think you’ll find the extra cost worth it. I certainly think paying a little more for the convenience and ease of using CLENPIQ is well worth paying a few extra bucks. I’m already planning on requesting CLENPIQ for my next colonoscopy! Colonoscopy Guidelines: Do You Need A Colonoscopy?